Keith Schooley, a former star financial consultant with Merrill Lynch who exposed widespread corruption at the firm prior to its collapse and acquisition by Bank of America, has been added to a prestigious publishing list in China. 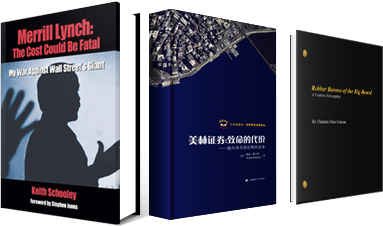 Shanghai University of Finance and Economics Press (SUFEP) (www.sufep.com), with annual sales of more than 90 million RMB, has just completed translation of Schooley’s groundbreaking book Merrill Lynch: The Cost Could Be Fatal – My War Against Wall Street’s Giant for sale in China. Schooley’s book exposes extensive corruption at Merrill Lynch including an unlawful widespread cheating scandal involving members of management and a multitude of financial consultants covered up by senior management and the board of directors—even after Schooley met with them to present his findings. Additionally, the author indicts regulators for their abysmal failure to regulate and reveals inherent flaws in self-regulatory sponsored binding arbitration. Joining such famous titles as The Great Crash 1929 by John Kenneth Galbraith, Understanding Wall Street, by Jeffrey B. Little and The Bear Book: Survive and Profit in Ferocious Markets, by John Rothchild, Schooley’s detailed witness account of wrongdoing at the Wall Street giant is certain to become a classic in China. The SUFEP series The World Classics of Investment is sponsored by China Universal Asset Management Co., Ltd. and published by a top Asian university of finance and economics. The series was designed to cultivate Chinese investors in their perspective and insight on the world capital markets. With solid support from academic research groups, the press continually puts out first-class quality publications and has won hundreds of awards from provincial and ministerial levels and above. Now that Wall Street has been bailed out by the Federal government and back to business as usual—handing out obscene bonuses while Main Street suffers and plotting ways to circumvent new government regulations, Schooley’s account may well serve as a manual for investors in the Asian markets should they discover their own financial titans following in the footsteps of Merrill and other firms that put personal greed ahead of public trust. Schooley’s current project—a feature-length film—is in its early stages. The author says, “I believe the silver screen will provide an incredible view and dramatically capture the corruption and players involved.” The cinematic presentation will depict the massive corruption on Wall Street and in particular, at Merrill Lynch.